Season 2, Episode 46 - Draven Grey Dan Sterenchuk and Tommy Estlund are honored to have as our guest, Draven Grey. Draven is an accomplished professional musician and author residing near Denver, CO, USA. 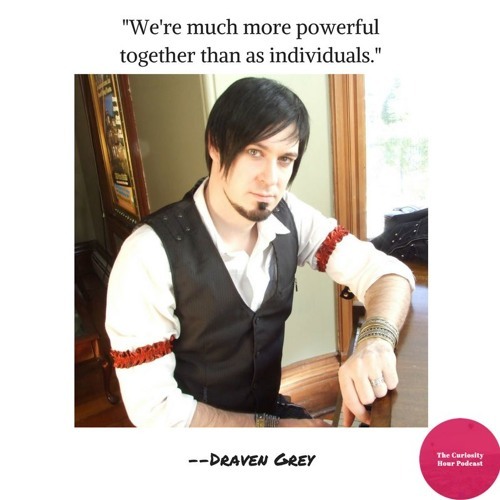 As a musician, Draven has performed in front of crowds in the tens of thousands, composed music for television and film, and been a guest on multiple projects - some selling upwards of one million copies. He has also published articles, books, and courses on the many facets of the music business, coached bands all over the world in their careers, and currently coaches singers through his business, Rock Singing Lessons. As an author, Draven spent over a decade intensely engaged in the academic study of ancient cultures and religions. Turning his focus away from academic expertise and into the powerful world of fiction storytelling, his stories draw from a rich history of parable, myth, and supernatural allegory now buried deep within our modern culture. Draven has owned and operated multiple businesses, from spiritual, relationship, and career counseling, to a graphic design firm, recording studio, and service-based record label. Additionally, he has worked as a freelance recording, mixing, and mastering engineer, a voice actor, clergyman, and artist. He also has training and experience in Business Management, Music Business, Marketing, Neuro-Linguistic Programming, Neuro-Associative Conditioning, Relationship-Counseling, Leadership Principles, Nonviolent Communication, Life-Coaching, and Creativity Coaching. His current personal passion is the production company and Lovecraftian world of The Silent Still, producing music, stories, art, film, immersive events, and more. You can read more about Draven at dravengrey.com, take singing lessons from him at rocksinginglessons.com, or explore his current world of storytelling at thesilentstill.com. The Curiosity Hour Podcast is hosted and produced by Dan Sterenchuk and Tommy Estlund. Please join our Facebook Group, The Curiosity Hour Podcast, to continue the discussion about this episode online: www.facebook.com/groups/thecuriosityhourpodcast/ Disclaimers: The Curiosity Hour Podcast may contain content not suitable for all audiences. Listener discretion advised. The views and opinions expressed by the guests on this podcast are solely those of the guest(s). These views and opinions do not necessarily represent those of The Curiosity Hour Podcast. This podcast may contain explicit language.